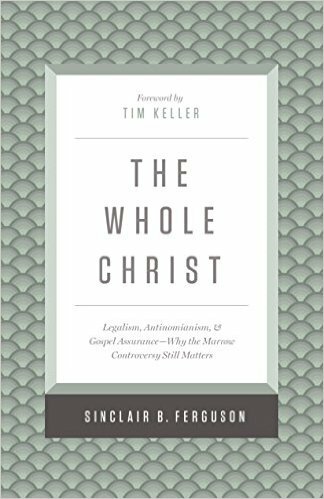 Editors’ note: The following is adapted from Tim Keller’s foreword to Sinclair Ferguson’s new book, The Whole Christ: Legalism, Antinomianism, and Gospel Assurance—Why the Marrow Controversy Still Matters (Crossway, 2016). The Whole Christ: Legalism, Antinomianism, and Gospel Assurance—Why the Marrow Controversy Still Matters is not just a helpful historical reflection; it’s also a tract for the times. The Marrow Controversy was a debate within the Church of Scotland in the early 18th century. The occasion, though not the main cause, was the reprint and subsequent division over Edward Fisher’s The Marrow of Modern Divinity. The root of the dispute was the perennial difficulty of properly relating works and grace, law and gospel, not merely in our systematic theology but in our preaching and pastoral ministry and, ultimately, within our own hearts. Sinclair does a good job of recounting the Marrow Controversy in an accessible and interesting way. However, his real aim is not merely to do that. Against the background and features of that older dispute, he wants to help us understand the character of this perpetual problem—one that bedevils the church today. He does so in the most illuminating and compelling way I know of in recent evangelical literature. That is an extraordinarily nuanced exposition of the Protestant understanding of justification by faith alone through Christ alone. All involved in the Marrow Controversy had subscribed to a precisely worded theological statement. How then could charges and countercharges of antinomianism and legalism arise that would expose a fault line in the church and eventually lead to a split in the denomination? While such theological precision is crucial, evidently it doesn’t finally solve this ongoing problem of the role of the law and of obedience in the Christian life. From the Marrow Controversy as a case in point, Sinclair draws several conclusions but expands and looks at each so that we can apply them to our own time. Here are some of his theses and arguments that I found so very helpful, convicting, and wise. The first and inarguable conclusion is that legalism and antinomianism are much more than doctrinal positions. Neither side in the Marrow Controversy was saying “You can save yourself through works,” or “Once you are saved, you don’t have to obey the law of God.” Neither side subscribed to overt, explicit legalistic or antinomian doctrine. Nonetheless, legalism and antinomianism can be strongly present in a ministry. Each is a web of attitudes of heart, practices, character, and ways of reading Scripture. At one point Sinclair even says, rightly, that a lega spirit consists in part in how you feel toward God. At the same time, practical antinomianism can develop even when doctrinal antinomianism is denied. It can take the form of a secular gospel of self-acceptance masquerading as Christianity. Even more often, it’s present when the minister’s preaching and pastoring is characterized by a subtle divorce of duty and delight. Any failure to present full, eager, complete obedience and submission to God as ultimately a great joy—as a way to resemble, know, and bring delight to God—is a tendency toward the antinomian spirit. The second thing I learned was that the root of both legalism and antinomianism is the same. My guess is that most readers will find this the best new insight for them, one that could even trigger a proverbial paradigm shift. It’s a fatal pastoral mistake to think of legalism and antinomianism as complete opposites. Sinclair says that, rather, they are “nonidentical twins from the same womb.” He traces both of them back to the “lie of Satan” in the garden of Eden, namely, that you can’t trust the goodness of God or his commitment to our happiness and well-being and that, therefore, if we obey God fully, we’ll miss out and be miserable. Because both mindsets refuse to believe in the love and graciousness of God, they assume that any commands given to us are evidence that he is unwilling to bless us. They both fail to see obedience as the way to give the gracious God delight as well as the way to become our true selves, the people we were created to be. They participate in the same incomprehension of the joy of obedience—they see obedience as something imposed on us by a God whose love is conditional and who is unwilling to give us blessing unless we do quite a lot of work. The only difference is that the legalist wearily assumes the burden, while the antinomian refuses it and casts it off by insisting that if God is really loving, he wouldn’t ask for it. In order to salvage an idea of a gracious God, antinomians find ways to argue that God doesn’t require obedience. Therefore, the third thing I learned was that to think the main problem out there is one particular error is to virtually put one foot into the other error. If you fail to see what Sinclair is saying—that both legalism and antinomianism stem from a failure to grasp the goodness and graciousness of God’s character—it will lead you to think that what each mindset really needs for a remedy is a little dose of the other. In this view, it would mean that the remedy for legalism is just less emphasis on the law and obedience, and the remedy for antinomianism is more. If you tell those tending toward legalism that they shouldn’t talk so much about obedience and the law, you are pushing them toward the antinomian spirit that cannot see the law as a wonderful gift of God. If you tell those tending toward antinomianism that they should point people more to divine threats and talk more about the dangers of disobedience, you are pushing them toward the legal spirit that sees the law as a covenant of works rather than as a way to honor and give pleasure to the one who saved them by grace. The gospel is designed to deliver us from this lie [of the Serpent], for it reveals that behind and manifested in the coming of Christ and his death for us is the love of a Father who gives us everything he has: first his Son to die for us, and then his Spirit to live within us. . . . There is only one genuine cure for legalism. It is the same medicine the gospel prescribes for antinomianism: understanding and tasting union with Jesus Christ himself. This leads to a new love for and obedience to the law of God. Since the root of both errors is the same, the cure is the same—to lift up the essential goodness and love of God by recounting the gospel, thereby making obedience a joy. The remedy for both is a fuller, biblical, and profound understanding of grace and of the character of God. There are plenty of other helpful veins of inquiry and argument in this book. Just to name two examples, Sinclair shows how the New Perspective on Paul can, in some instances, encourage a more legalistic way of reading the Bible, while those who criticize the traditional threefold nature of the Old Testament law—moral, ceremonial, and civil—can support an antinomian mindset. However, here are the main inferences I draw from this fine book for our current discussions around these issues. Calvin called justification the “chief axis” or “main hinge on which religion turns.” He proceeded to say that “unless you first of all grasp what your relationship to God is, and the nature of his judgment concerning you, you have [no] foundation . . . on which to build piety toward God” (Institutes of the Christian Religion, 3:11:1). That is certainly right, namely, that our justified standing with God cannot be “one motive among many.” It must be the foundation of all our thinking, feeling, and doing; otherwise our default mode—our belief that God is not for us—will pull us back into a covenant of works. But if it’s true that our main problem is a disbelief in the love and goodness of God, then to say, “All you need for sanctification is to believe in your justification,” is too simplistic. That may lead you to try to cure a legalistic spirit with just less emphasis on law. You need more than just an abstract belief in your legal exemption from punishment; you need a renovation of your view of God. On the other hand, John Owen, in his work on mortification, shows that the answer is not just to say, “What you need for sanctification is to work hard to become holy.” Owen argues that the root of our sinful behavior is an inability to hate sin for itself, and this stems from a tendency to see obedience as simply a way to avoid danger and have a good life—not as a way to love and know Jesus for who he is. So to grow in grace comes not simply from believing more in our justification, though we should meditate on that reality daily. Understood more comprehensively, it flows from using the gospel of grace on the root of our sin—the mistrust of God’s goodness and the inordinate love of other savior-things. When we behold the glory of Christ in the gospel, it reorders the loves of our hearts so we delight in him supremely, and the other things that have ruled our lives lose their enslaving power over us. This is sanctification by going deeper into the gospel, but it’s not merely telling yourself you are accepted and forgiven, as foundational as that is. In The Whole Christ, Sinclair Ferguson shows us how important it is for preaching and pastoral effectiveness to get this straight.